Before integrating Facebook SDK to your android app you have to create a Facebook app on your Facebook developer console. Visit Facebook developer console and create a new Facebook application. Once you create the application you will get an app id, which is used to uniquely distinguish your application from others. This AppID will be used along with each of the request we make to Facebook server. Don’t get panic, sometime it takes some time to make your application go live. 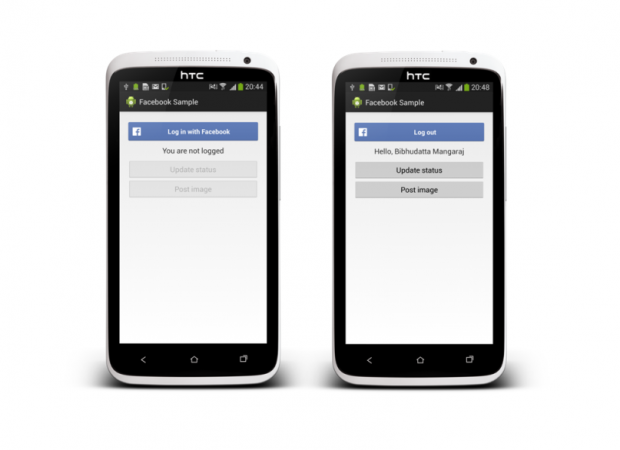 Now you have created an Facebook app in developer console and you are ready to start with our Android app. You may create a new project or import an existing one. Import Facebook SDK to your eclipse workspace and make sure it builds successfully. Once it builds we have to attach the Facebook library project to your Android project. The easiest way to attach the SDK is to add it as an Android library by going to the project’s properties. Now do the following changes to your application manifest file. Put the following code before </application> tag. Make sure you are using your own AppID obtained from Facebook developer console. Note: Make sure that you have give android.permission.INTERNET permission in your application manifest file. Now define layout for your activity class. In this example, We have three sample buttons. How do I get email ID from facebook API ? thanks for posting but i am not able to get any data from user.. user returns null value how to fix this ??? Did you request for appropriate permissions? com.facebook.widget.LoginButton has been changed to com.facebook.login.widget.LoginButton in version 4 of Facebook SDK. Using that should fix the error with both xml and R.
Hi Can you please explain the role of UILifeCycleHelper in this code ? Why is it used ? hi i have one problem get. only one user first login than image share. but second user login and than image are not post. hi m devendra sharma android developer. i have one problem get use in this code. only one fb id ragister and another id login in this code than they are login but share an image. so plz help me. Did you create a app in Facebook developer console? Looks like some issue with the Facebook sdks. At runtime the sdks is not found. Rebuild or restart eclipse. Thank you. This is 10 times better than the official facebook documentation. Please do paste the error log. Difficult to trace without it. your application worked on my phone but did not work on the phone from my brother, when I click the login button and does not open the facebook page which asks permission to access and post. Hi very nice tutorial.But update status and post image function is not working.It ask me again to login.When Im done it does nothing.Kindly help me.Thanks in Advance. Is this discussion still active ? the username is not getting displayed in my case. i checked everything. Hi it allowed me to login only once and that to i couldn’t post any status update or upload any image. Download the sdk. It comes with sample that fetching profile pic from fb. where can i get the token so that i post photos in other activities ??!! you may store the token. can someone please explain the working of this code? some methods are pretty confusing ? can this be achieved without fragments? Would like to reach earlier devices to Level 11. Thanks! @Risk, very much doable with simple activity. Perfect example… I was messing around on the Facebook dev pages for a few hours and didn’t get very far. This sample exactly what I was looking for. i can only run the App successfully once even I commented the sentence “buttonsEnabled(false); “. how can i do if i want to send several status by clicking the button for several times?